The viaduct unifying the territory of Ciego de Avila with Cayo Coco, also connect Cayo Guillermo a small isle of 13 square kilometers which reached a public transcendency thanks to the feather of the famous north American writer Ernest Hemingway, who eulogized the extraordinary beauty of the place in his work Islands in the Gulf. 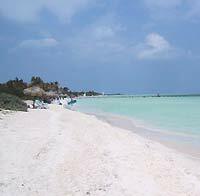 Four Kilometers of beach and the highest dunes of the Caribbean-some of them reaching even the 15 meters- are some of the gift from this part of the Cuban archipelago, known like the Jardines del Rey, as it was baptized by Diego Velázquez in the year 1514. Other of the undeniable attractiveness of Cayo Guillermo are its very well conserved eco-systems and its marine bottoms, protected by coralline barrier that occupies the second in extension in the world , only surpassed by the one existing in Australia. 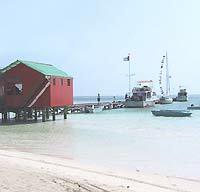 Media Luna and Los Felipes keys, located in front of its costs, are two of the area of higher potentiality for the diving practice, in addition to the platform and high fishing. In the environs, is also Paredón Grande Key, a suitable place for the enjoyment of the landscape, a unique possibility given by the lighthouse Diego Velázquez, which still offer navigation services.